No real reason for posting this particular Rovers side. Chosen only because I have it and it's a nice 'go with' for the previous photo of John Lewis. Front centre, with the ball at his feet, is the legendary Bob Crompton, described in Mike Jackman's book 'A Complete record', as ''the greatest 'Rover' of them all''. So there you go. Frederick Beaconsfield Pentland is second from the right(middle row). The hut behind looks the same one as on his individual picture. This one looks "hand coloured" with the shorts dark blue and a mixture of blue "right hand" and "left hand" shirts. Pentland's is a fascinating football tale playing internationally, interned in WW1 after going to manage the German Olympic side. Managing France in the 1920 Olympics then a succession of club side in Spain. 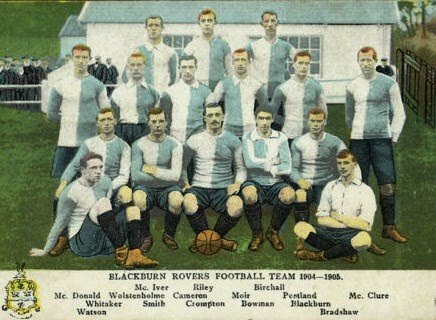 I know it's not a Blackburn tale, but interesting nonetheless. Thanks for the info BTS.